Every year during their nesting season (late May through July), hundreds of adult female diamondback terrapins are killed on roads crossing or adjacent to salt marshes along the New Jersey coast. In an effort to reduce this loss, researchers at The Wetlands Institute have undertaken development programs since 2004 to determine if roadside fencing might be a practical means of preventing nest-seeking female terrapins from wandering onto the heavily-trafficked summertime roads. Our research has demonstrated that terrapin barrier fences1, when carefully designed to satisfy numerous practical requirements, can indeed significantly reduce the number of terrapin road kills. We believe that widespread use of barrier fencing in appropriate locations can save many hundreds, if not thousands, of terrapin lives every nesting season. We have prepared this article as a practical guide for anyone interested in developing their own terrapin barrier fence project. Using our procedures, we are pleased that in recent years teams from nearby coastal communities have implemented their own terrapin barrier fence projects. 1) The words fence (or fencing) and barrier are used synonymously to denote a structure that prevents travel across a boundary. Fences are usually thought of as 2-dimensional-like structures whereas the tubular structures we will be discussing, though acting as fences, are not fence-like in appearance, and are sometimes better referred to as barriers. In addition, we sometimes use “barrier fence” and “conservation fence” as all-inclusive terms. Damage mechanisms include those from wind, snow plowing, overgrowth by weeds, mowing, weed-whacking, and careless vehicular operation. Loss of durability can be caused by UV embrittlement, corrosion in a saline atmosphere, and weakness induced by temperature extremes from summer to winter. At one stage or another during our seven year program, all of these damage and degradation mechanisms have been experienced. In choosing a fence, the weight given to items in the above list changed over the years as our program evolved. At its outset in 2004, cost, safety, and effectiveness were the main considerations. Silt fencing was the obvious initial choice. As discussed in a later section, the consequences of its unacceptable appearance then led us to Tenax plastic net fencing. After several years of favorable experience with it, durability problems emerged, causing us to search for an alternative. Currently, we are evaluating corrugated plastic tubing, which continues to look promising. Vinyl coated chain link fencing is still a candidate, but its high initial cost and other disadvantages have caused us to view it unfavorably. There may be any number of other terrapin barrier fence design alternatives and we are open to new ideas. Table 1 draws together and ranks the various attributes of the fence alternatives we have considered. Further discussion of the merits of the fence alternatives is presented in later sections of this article. Because of shrinking nesting habitat elsewhere (due to human encroachment), the berms of roads have become common terrapin nesting habitat. Consequently, the placement of a fence will be a compromise between the requirements of the responsible county or municipal engineer charged with ensuring the safety of motorists, cyclists and pedestrians, and the need to maximize potential nesting area. 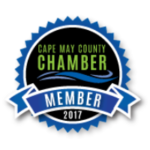 Additionally, access and space must be provided for mowing and other maintenance operations. Our choice of silt fencing to start the Institute’s program was dictated by its low cost, availability, and immediate acceptance by the County Engineers Office. 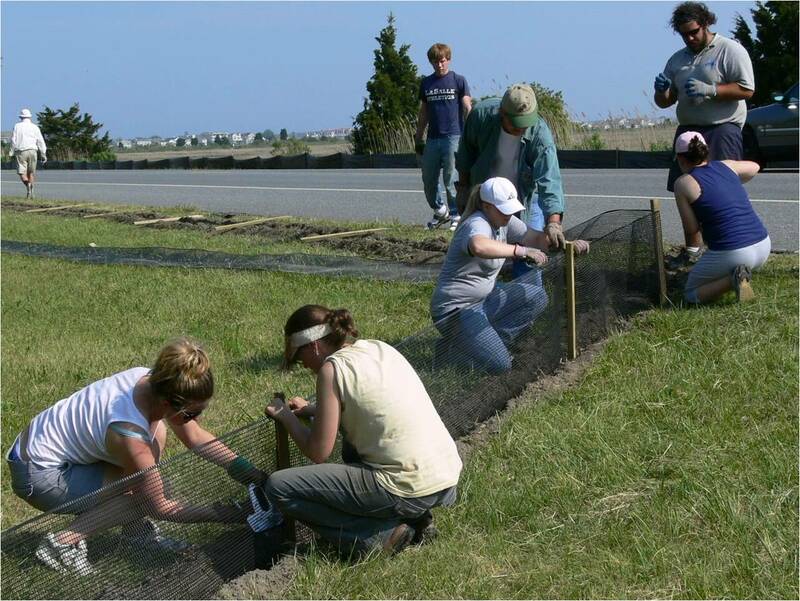 In June 2004, an Institute team installed 2300 ft along the west side of coastal Rte 619, which runs parallel to Whale Beach in northern Sea Isle City. Road patrol data had shown this area to be a terrapin road-kill hot spot. Along the fenced section of highway, similar to that shown in Picture 1, a significant reduction in road-kills was observed relative to prior years and we were encouraged to continue and expand the program. Residual road-kills in the area were due to gaps in the fencing at road access points. At the end of the nesting season, the silt fence was de-installed because of its unattractiveness and susceptibility to damage by prevalent shore winds. We were especially anxious not to test the patience of local citizens, who had given us permission to install the fence on their properties, by leaving it up during the off-season. The following year (May 2005), silt fencing was reinstalled in the Whale Beach area. Also, roughly 4000 ft was installed along both sides of Stone Harbor Boulevard (SHB) adjacent to the Institute. Again, it performed its conservation function well, with major reductions in road kills. Continuing public acceptance and support of our activities was encouraging. But the limitations of silt fencing, noted above, remained. Of most concern, however, was the strain on our human resources (interns and volunteers) to remove it at the end of the nesting season and then reinstall it the following season. 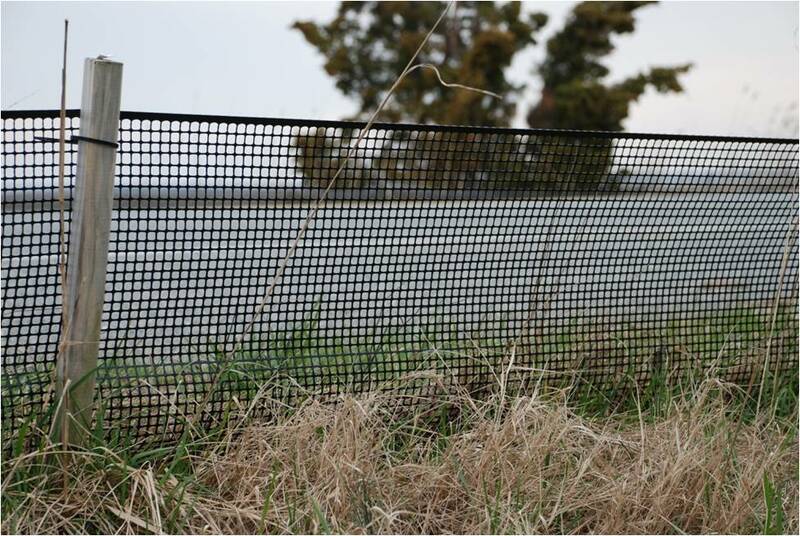 We felt that Tenax net fencing offered the prospect of year-round durability, reasonable cost, and improved appearance. Like silt fencing, its installation requires generation of a trench, roughly 6” deep and 6” wide using a ditch-witch (motorized trenching machine). The fencing is installed in the trench as shown in Figure 2. 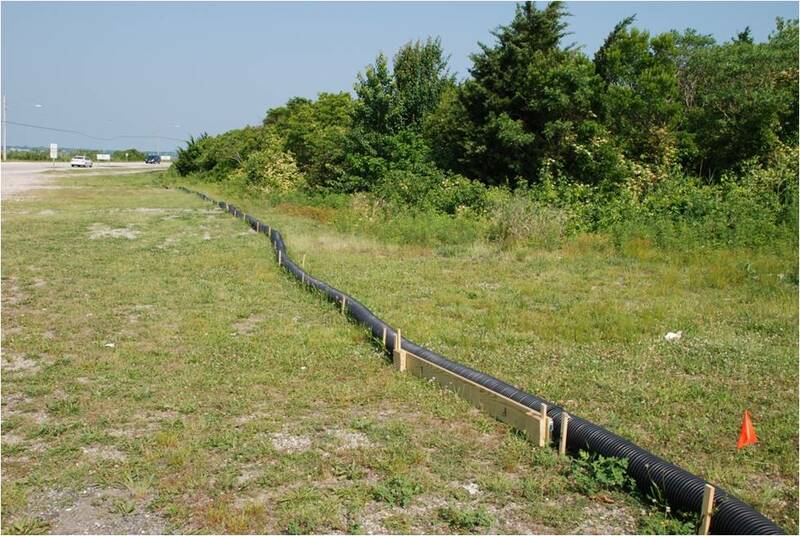 One thousand feet of black Tenax fencing was installed (Picture 3) along SHB and its effectiveness as a terrapin barrier was verified during the 2006 nesting season. By leaving it in place through the following winter, its year-round durability was assessed as promising. 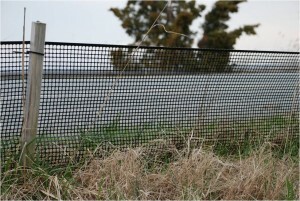 Several thousand feet of Tenax fencing, both the black and a so-called silver variety, was subsequently installed along local causeways. Through the 2007 and 2008 nesting seasons, its performance as a terrapin barrier was satisfactory. No worrying physical degradation of either the black or silver types occurred over these relatively mild winters. The winter of 2009 was extremely harsh by comparison, with temperatures below 15F for extended periods, along with several heavy snowfalls. The silver fencing began to exhibit a tearing-type of failure in many sections, as shown in Picture 4. The failure of the silver fencing was due to embrittlement and loss of pull strength, probably caused by UV induced degradation and manufacturing anomalies coupled with physical contraction at low temperatures. In contrast, the black Tenax fencing showed little degradation. Even after four years in the field, the original black Tenax fence material shown in Picture 5 is still flexible and sufficiently strong to withstand physical contraction at low temperatures. 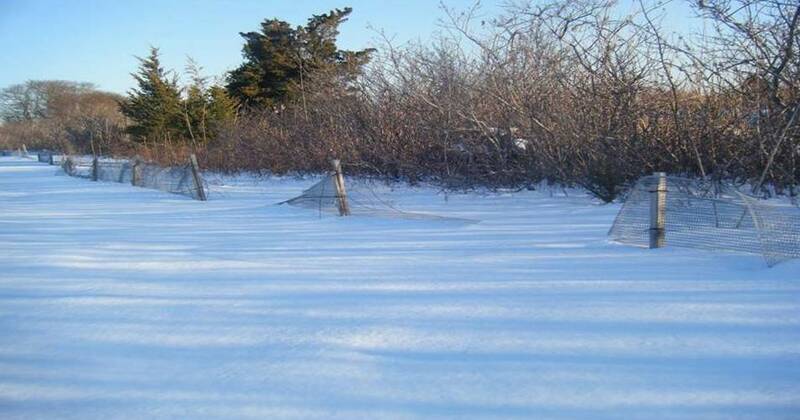 Both types of Tenax fence are susceptible to damage from snow thrown against them during snow plowing operations and to damage from weed whackers, used to keep vegetation along the fence in check and to preserve a neat appearance. Repairing damaged Tenax fence is very time consuming. In spite of its drawbacks, black Tenax fencing can be durable enough and cost effective in some situations. But we continued to search for a better alternative. Early in 2009, we conceived the idea of using commercially available black, 6” i.d. (7” o.d.) 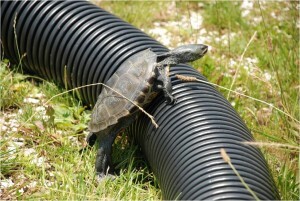 corrugated plastic drainage pipe as a terrapin barrier. During the 2009 nesting season, its effectiveness as a barrier was experimentally tested using captured terrapins confined to circular tubing pens. Details of these experiments will be described elsewhere. We concluded that even the largest terrapin was unable to scale 6 inch tubing, as shown in Picture 6. Later, the behavior of captured terrapins, during both daylight and at night-time, was studied as a function of gap size under the tubing. The results, also to be described elsewhere, were useful in optimizing installation details. We evaluated several designs for securing the 6 inch tubing to a berm. Details of our preferred installation design are shown in Figure 7. Installation procedures are provided in Figure 8. Although 24 inch long, 0.5” diameter rebar, has some advantages over wood posts, our County Engineers Office vetoed its use because of the risk of accidental impalement. In order to mow the grassy berms, highway personnel need “gates” in the tubing barrier. Our design and installation instructions for these are provided in Figure 9 and Figure 10, respectively. In June 2010, over 7000 ft of corrugated tubing was installed along the Margate Causeway by a task force comprised of Margate volunteers and Institute personnel. It proved much quicker and easier to install than either silt or Tenax net fencing. No trench is needed and its flexibility allows it to conform to longer ranged (≥ about 18”) contours of the ground. Visually it is quite unobtrusive, as shown in Picture 11. 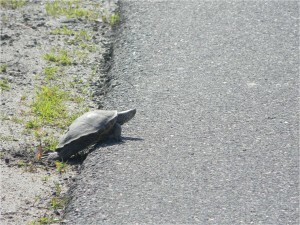 Its performance as a barrier was encouraging, although a number of terrapins somehow reached the road and were killed. Later examination showed there were several locations where, due to locally uneven terrain, there was a gap under the tubing exceeding 1.5 inches, making escape under the tube possible. There is also the possibility that in their search to find a place to form a nesting hole in the very rough and hard berms along many stretches of the Margate causeway, some nesting terrapins may end up burrowing their way under the tubing. Means for combating this are under consideration. Refinement of the installation of tubular barriers is still a work in progress. Although present cost of corrugated tubing barrier at $0.98/ft is reasonable, it should be cautioned that this may rise if the price of oil rises and stays above $90/barrel. Susceptibility of 6” corrugated tubing to damage during weed whacking was tested using a large professional sized whacker. As normally used, the weed whacker lightly burnished the corrugations. When left in one section of the tube, the corrugations became dented, but not cut, like Tenax fencing. During this winter (2011), there have been several heavy snow falls and occasions when temperatures dipped to 15F. No failure mechanisms associated with these extremes have been observed. Recognizing that the tubing is constrained from moving at the posts, it is believed enough flexibility remains in the corrugations to prevent any tendency for the tube to degrade during expansion and contraction cycles. With its low profile of 7 inches, compared to the 18 inch height of Tenax and silt fencing, we expect pedestrian-induced damage to be insignificant. Terrapin conservation fence alternatives are faced with satisfying a surprisingly large number and variety of requirements. We have progressed from the early use of silt fencing, chosen for its immediate effectiveness and low materials cost to commercial corrugated tubing. While the latter has so far proven attractive in all evaluation categories, it has been in the field for only one nesting season and winter. More time is needed to prove that unexpected failure mechanisms do not emerge over time. 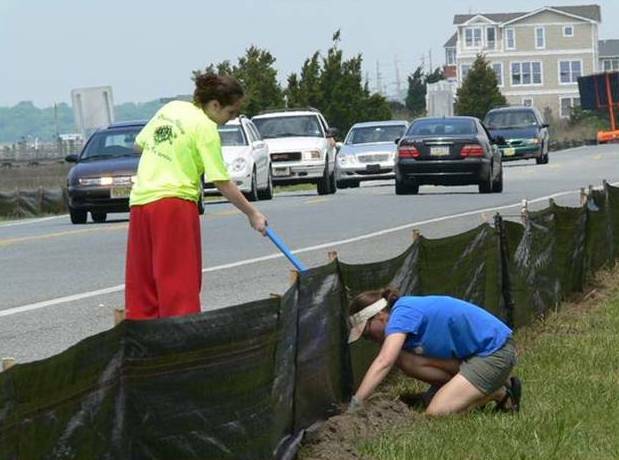 As noted above, our fencing program has been well received by communities in southern New Jersey, where individuals, groups, and municipalities have completed terrapin conservation fence projects in their own localities. We hope the guidance presented in this article will facilitate the implementation of terrapin conservation fence programs in other areas of the terrapin’s range. We welcome dialogue with anyone interested in this subject and we are eager to learn from other’s experiences. 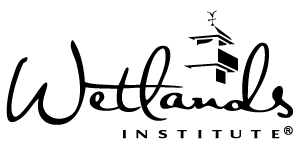 So, please contact us at research@wetlandsinstitute.org with any questions or comments.